Yards, they can get. Points? Not so much. If nothing else, that will be the legacy of your 2018 Tampa Bay Bucs. Rarely has an NFL team gained so many yards and won so little because of it. There have been a lot of big plays, but not nearly as many scoring plays as you would like. Even with their recent slump, the Bucs rank third in the NFL in total offense. And they've won just five times. Pretty much, you can count on the sun rising in the East, music coming on the radio and the Bucs finishing with five wins. Anything else is an upset. They win five when the offense is good, and when the defense is good, and when there is a running game. They settle into five wins as if they were putting on a comfortable pair of shoes. James Bond is going to win in the end, and Zorro is going to leave a "z" on someone's behind, and the Bucs are going to win five. Consider last season. The Pittsburgh Steelers were third in the NFL in total offense with 37 fewer yards a game than the Bucs. They won 13 times. The season before? Washington finished third in offense. They went only 8-7-1, but at least they had a winning season. If the Bucs had an eight-win season this year, Dirk Koetter would get an extension and a free meal at Kojak's. In 2015, the Steelers were third again. They won 10. In 2014, the Colts were third. They went 11-5. In 2013, it was Green Bay that was third. They went 8-7-1 and won their division. You get the picture. In the offensive-minded NFL, moving the ball is supposed to translate into collecting victories. Not so with the five-win Bucs, who turned it over and were called for penalties and stopped in the red zone often enough to take their usual spot in the NFC South cellar. And, yeah, that's where they live. The Bucs' offense seems to have been dialed back by the competition. Instead of being open long for most of the afternoon, they've had to check down. “We’re a vertical passing team, so we’re not basing what we do on offense on completion percentage -- even though overall in the league completion percentage is through the roof this year – Jameis has his highest completion of his career this season," Bucs coach Dirk Koetter said. "We believe in throwing it down the field. Teams know that what we try to do. What are teams going to try to do against us? They’re going to try to force us to check it down. Unless the Bucs win Sunday, it will be the 10th time in franchise history they have finished with five wins. Granted, one of those was a 5-4 record in 1982 that actually qualified them for the playoffs. But still, when almost a quarter of your history (43 seasons) has seen your team finish with five wins, it leads to a lot of frustrated fans. On the other hand, five wins is at least five wins. The Bucs have had 12 seasons when they won fewer. In a bad lot, then, who is the best of the Bucs' five-win seasons. Might this year's team be the Lord of the Flies? 1. 1982 Bucs: In a strike-shortened season, the Bucs actually made the playoffs, overcoming a 2-4 start and finishing with an overtime win against Chicago. The Bucs were bounced out of the post-season quickly, but they finished with the league's third-best defense. Doug Williams was sixth in the league in passing. 2. 1988 Bucs: Ray Perkins didn't have a lot of good moments, but his 88 team finished in the top 20 on both offense and defense. Steve DeBerg had a rating of 73.5. James Wilder was slowing down and had just 343 yards. 3. 2018 Bucs: Despite a 2-0 start, the Bucs fizzled. But Winston did have a rating of 87.0 (third among the five-win seasons) and the team had its best offensive showing with a third-place ranking. 4. 2004 Bucs: They weren't that far removed from their Super Bowl win. These Bucs lost their first four and their last four. They did rank fifth in the league on defense and Michael Pittman ran for 926 yards. 5. 1980 Bucs: The Bucs were 5-10-1 in '80. Doug Williams finished eighth in the NFL, but Ricky Bell had just 599 yards rushing. That Bucs team, too, was 2-0 and collapsed, losing six of their last seven. 6. 1992 Bucs: Wyche, Perkins and Dirk Keotter all had back-to-back five-win seasons. It hurt in '92 because Reggie Cobb ran for 1,171 yards. The team went on a 1-10 streak during the year. 7. 2017 Bucs: Tampa Bay finished ninth in the league in offense. The defense, however, was dead last in the NFL, the only last-play finish of the five-win seasons. Winston had a rating of 92.2 and his average of 269.5 was the highest finish of the five-win seasons. 8. 1989 Bucs: Lars Tate led the team in rushing with just 39.3 yards per game. The Bucs were 3-2 at one point and faltered. Vinny Testaverde threw 22 interceptions. 9. 1993 Bucs: Craig Erickson had a rating of just 66.4 for the Bucs, who were 22nd on defense and 25th on offense. The Bucs started off 1-5. 10. 1978 Bucs: The Bucs had won only two games in two seasons, so five wins didn't sound that bad. But Tampa Bay was still growing. Doug Williams had a rating of 53.4. The Bucs lost seven of their last eight. 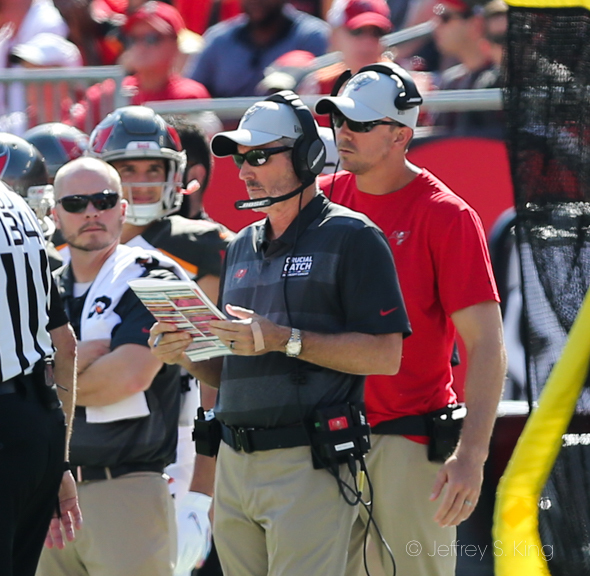 Next post: Is there a leader among the Tampa Bay Bucs?